There is some controversy about this question. There have been multiple questions about non-disclosure agreements. A quick look at the tag shows that many of them are open, even though just as many of them are not specific to software development, a requirement recently clarified and enforced. However, there can be little doubt that non-disclosure agreements are extremely relevant to programmers, and there is currently no other place to ask such questions on StackExchange. Should P.SE allow, in general, questions about NDA that apply to programmers, even non-exclusively? If not, what should P.SE do to make it clear to people reading grandfathered-in questions about NDAs that the same question, asked today, would be considered off-topic? No, questions that are not unique to software development or require the perspective of a professional in the software development community do not belong on this site. Questions that do not apply unique to professional software developers nor require knowledge or skills that are unique to those working in the software development profession are off-topic here. Non-disclosure agreements do not require the knowledge, experience, or expertise of professionals working in software development and are therefore off-topic for our site. At one point, this question was flagged for possible migration to The Workplace. We pinged their moderators, who brought it up for discussion in their site chat. The Workplace tends to not accept questions that are legal-oriented, and the moderators did not accept the migration request. Therefore, it remained here and closed. Older questions that are still open do not mean that it is OK to ask similar questions. If they are old enough, have enough interest, and have valuable answers, it might be OK to historically lock them. This lock prevents all editing or voting and indicates that the question is no longer a good example of an on-topic question, but contains information useful to our community. Other questions should be closed to properly reflect the scope of our site. Part of the reason why old questions may not have been closed is that the community never voted to close them and no one flagged them for moderator review. The review queues are a recent addition to help solve some of these problems and make questions with close votes more visible to users who can handle them. Note that some questions may not have a home on the Stack Exchange network at this point in time. A lack of a better place does not mean the question can be asked anywhere and remain open. A Stack Exchange site is supposed to draw on a community of experts, in our case, experts about software development. The key factor that I think makes this "freelancing and business concerns" question suitable for the site is that it is specifically seeking an answer from a professional programmer. If it were seeking legal advice I would say it's off-topic, but it appears to be seeking an answer from a programmer, not an answer from a lawyer, which I think makes it a valid "freelancing and business concerns" question. The graphic Thomas references from our FAQ was created to help define what makes an on-topic career question, and was not meant to be applied to all questions. I'm not sure when that got changed in the FAQ, however your question definitely does not apply to "all careers" or even "most careers". 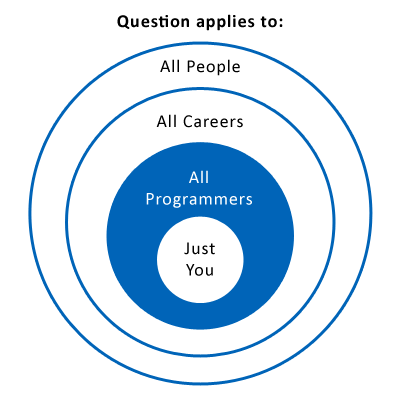 In fact, I doubt it applies to "all programmers" either, however I would say it applies to more than "Just You", so you're safe from being "too-localized". Not the answer you're looking for? Browse other questions tagged discussion on-topic-definition moderation . How many times can a question be closed and reopened? What types of subjective questions are not acceptable? Why are questions about programs verboten? Are questions about Developer Agreements on topic? Are questions about issue tracker recommendations on topic?